Put on your helmets, Messieurs! I guess that a VR helmet is the brightest symbol of digital epoch. Take for example some Hollywood films on this subject: a hero is certainly in a helmet on his head or a hypertrophied eyeglasses in order to get into this world and start a struggle against the world evil. Eyesight turned to be the main perception source both in real and virtual world. That's why a lot of companies rack their brains over creation of convenient facilities allowing to plunge into the virtual world. IIS (Interactive Imaging Systems) is one of the pioneers in this field. Their first product (VFX1 virtual reality system) came onto the market more than 5 years ago, and although it was not a widespread product, it became a mean landmark on the way of virtual reality devices to an end-user. Before that moment a range of virtual technologies was a prerogative of the military. For example, variants of VR head mounted display for pilots of helicopters and some other military trainers have been used for a long time already. A usual user can only envy looking at the characteristics of the military devices. But note that such systems cost up to $250,000. But the progress in the virtual reality systems is unfortunately moving too slow. Comparing it to the sphere of, for example, CPUs, it seems that the market of VR helmets is going through a complete deadlock. But it is wrong. First, recently the number of companies involved in production of such systems has greatly increased. Secondly, the devices have found an additional use. Usage of VR eyeglasses or helmets while watching DVD-movies (e.g. from a portable player) allows feeling like in the cinema. If you are interested I can recommend you this site where you can find a huge variety of VR devices. Audio - as a rule, in the form of headphones. Expensive models sometimes include quadro-headphones in order to provide a more comfort for listening 3D-sound. Video - two displays (or panels), one for an eye. They can be LCD or CRT (now they are rear). Manufacturers usually specify the maximum resolution the device is capable of, but it rear corresponds to the physical resolution of a panel. You can calculate a real resolution of the panels according to the formula height*width*3pixels=real panel's size (3 pixels is for RGB, in order to get own color pixel). So, in order to get 640*480 the panels must be 640*480*3= 921,600 pixels. And now comes tracking. Unlike VR glasses which require additional sensors of head movements, helmets always have built-in sensors, and as a rule, for several directions of movements. Usually it is: turning of the head to the right/left, inclination of the head to the right/left, inclination of the head up/down. The helmet works simply. You just connect it to the computer and get an image which is on the display at that moment. For more interesting modes, e.g. viewing of stereo or tracking in the virtual world, you are to have the appropriate software. Now we are turning to consideration of a definite model of the helmet. 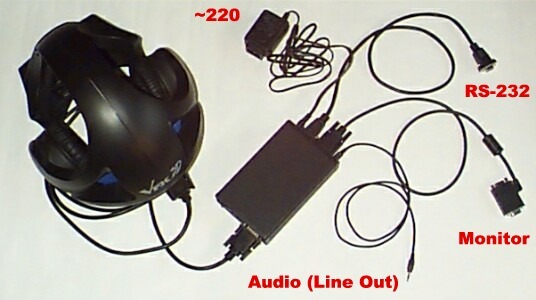 The complete set includes the following things: the helmet, a black LinkBox ( all signal sources are connected to it), and cables. Unfortunately there were neither user's manual nor software. IIS site, however, contains all necessary things. Besides, I got the CyberPack joystick, which a while ago was supplied together with the helmet, and now it's like an additional periphery. A principle of operation of this joystick is based on the tracking system working. The joystick has two sensors which controls its inclination to the right/left and forward/backward, and three buttons. A base for all connections is the LinkBox. On the photo below you can see the whole variety of its connectors. On the left photo you can see its side which is responsible for signal output. There are two connectors: S-Video and a the one connecting the LinkBox with the helmet. Besides, there is a power switch button for the whole system. On the right photo you can see a side which provides communication with a computer. 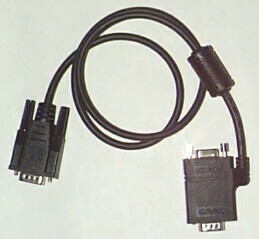 Left to right: Audio-in connects Line Out on the sound card, VGA - via a special pass-through cable is inserted into the video card connector, and a monitor is connected to it (see the photo below), RS-232 input connects a free COM port, and at last, power supply unit's connector provides operability of the whole system. Consequences of usage of the VGA pass-through cable were rather sad. An image on the monitor was soapy, in the best traditions of old Chinese video accelerators on the Voodoo 1 chipset which also used a similar VGA pass-through cable. The photo illustrates a completely assembled set (not connected to the monitor). Installation of the software is simple. 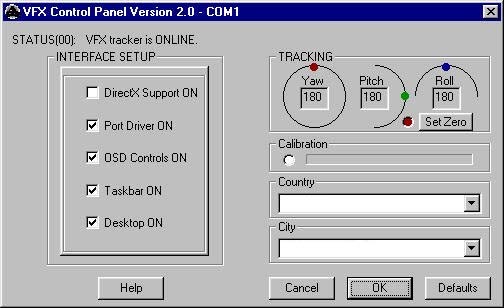 You setup the program, and then it installs two utilities and drivers necessary for working of the tracking system. The utility provides calibration of tracking sensors and setting of soft interface. This program must give a possibility to launch game programs which are on your computer in a mode allowing you to use all possibilities of the VFX3D. The CyberPack joystick connects as a standard joystick to the game port. After that you have to write it in the "Game Controllers" as a usual joystick with two axes and three buttons. Calibration of the joystick is implemented in the section "Game Controllers" as a usual joystick (with standard means). If you are doing it for the first time, it will take you some time to get used to it, though I can't say it to be convenient, but in virtual world it seems natural. Calibration of the helmet is an exhausting process because of great number of sensors. For calibration we used a utility VFXcontrol. Of course, you can set default settings but for better comfort you'd better spend a couple of minutes for this procedure. The calibration is rather simple, but a bit tiresome. You are to calibrate all three headsensors one after another. You'd better start with the Yaw. Click the Calibration button and then turn slowly the helmet by 360° three times, and then carry out this procedure with the other sensors (Pitch, Roll) and then turn off the Calibration button. Then you can apply to the section INTERFACE SETUP. The item DirectX Support ON included in here controls operation of tracking sensors in games, using DirectX procedures. So, for the helmet you can use only Directx, and you can forget about OpenGL and Glide forever. Here I faced the first trouble. The helmet's drivers can't work with the DirectX higher than 7.0a version. So, I had to migrate from DirectX 8 to DirectX 7. Besides, I found out that the helmet doesn't work with the Windows ME and 2000. Now, after installation of DirectX 7, I can put the helmet on my head and start adjusting video parameters. The helmet fits the head perfectly thanks to a thick and soft layer. It doesn't squeeze the head too much. In summer I think it will be a bit hot in it. I should note that the helmet doesn't block the real world ideally. 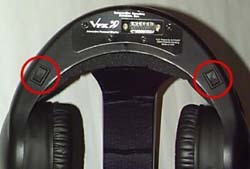 Headphones eliminate external noise perfectly, but when you are looking on the LC-displays you should concentrate on the image in order to neglect the surrounding world. Now we are going to consider video parameters of the helmet. 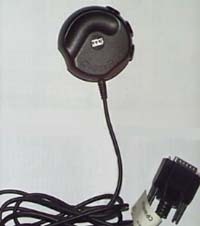 The control is implemented with two-position swinging buttons located on the low surface of the helmet (on the photo they are encircled with a red pencil). When pressed the left button provides access to video settings menu: brightness, contrast, tint etc. Pressed, it cyclically goes through all elements of the menu. After you have chosen an element with the right button, you can change its value. Pressing the left button backward you can access video modes Mono, Stereo1, Stereo2. Stereo1 and Stereo2 are reverse modes. When switching from one mode to the other you will see a writing "Left Eye" on one of the displays. It's necessary to check the program whether it sets the sources for the right and left eyes correctly. The menu disappears in two seconds. In case the menus called with the left button are not active, the right button is used for volume control in the headphones. Note that it's better to adjust the image for the definite program, and do not try to achieve an acceptable quality for scanning the Windows desktop. Now it's necessary to select games out of the list and check their operation. You might be surprised that I didn't concern an issue on working in the helmet without a monitor. I left this issue aside since image quality is just awful. The helmet can't replace a monitor. Most likely it is connected with low resolving capacity of the LC-displays (360k = 263*480*3). That's why I used the helmet only for entertaining. Out of the whole game list I had only UnrealTournament and SystemShock 2. 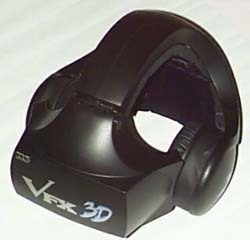 The both games supported 3D stereo/tracking. As a starting point I used VFXLauncher utility. But the utility has found a directory with the game and gave out a message that the tracking is not supported (and I had either to delete the driver or to left as it was). So, I deleted tracking driver from Game Controllers. Again starts VFXLauncher and then comes the game. Now there comes a message that the game requires tracking driver and a proposal to install it. After recovery of tracking drivers we launched the game ignoring this message. SystemShock 2 pleased me with a flawless working in stereo mode and full support for tracking system. Now come my impressions on the device operation. Video quality is moderate, color rendering has a long way to go. Attempts to adjust helmet's parameters in order to reach more or less acceptable image quality failed. Playing in stereo mode, though, leaves an unforgettable impression. Volume of objects impressed me a lot. Even in monomode all objects possess some kind of voluminosity. Headtracking, though, worked not that good. From time to time when I turned my head looking at the ceiling and floor of the spaceship, tracking went off, and the image twitched markedly. Probably I should pay deeper attention to calibration of tracking sensors. Besides, it took me some time to get used to aim with the head movements. Moreover, eyes get tired very much while working with the helmet on. Now they advise to work not more than 15 minutes and then to have a rest. Furthermore, it's curious to watch a DVD-movie in the helmet. In fact, it turned to be quite good: it looks like sitting in the cinema somewhere in the 9-10 rows. And with the PowerDVD program it looks that the film is showed on a normal wide screen 16:9. Unfortunately, color rendering is moderate. When watching DVD the eyes do not get tired too quickly, though it's still dangerous to watch the film non-stop. Sound quality is good, but I think that for such device they should make better headphones. The progress as compared with the old model is obvious. Video quality improved much: the old helmet supported lower resolution and could work only in 256 colors mode. But image quality is still average and can't satisfy even a usual gamer. And rather quick tiredness of the eyes makes the purchase a bit early. This helmet can, however, be used for educating and demonstrating clips, and in gaming clubs. Whatever you may say, but the impression of already familiar games is unforgettable.